Welcome to Garvagh, a rural village, nestling in the foothills of the Sperrins and Lower Bann Valley, and located on the main arterial route to the North Coast, Northern Ireland’s premiere tourist destination. With a population of around 1500, this typical Plantation town, with its wide main street, originally designed to allow a team of horses to turn, has a rich and vibrant history since its establishment by the Canning family in the 17th century. Over the years, Garvagh has achieved fame for its sportsmen, authors, musicians, poets and characters. It’s agricultural achievements include hosting one of the largest annual vintage shows in Ireland, each September. Its musical talents include the famous Hampsey Harpers and Garvagh Museum and Heritage Centre, located behind the Clock Tower, is home to a large collection of historical and cultural treasures and is the largest, private, rural folk Museum in Ireland. 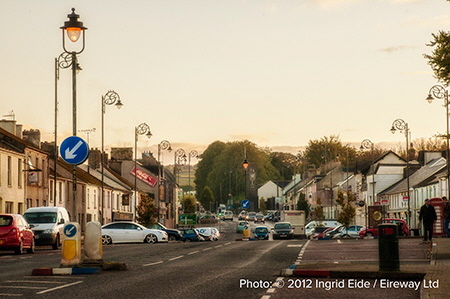 More recently, Garvagh has become a hub of light industry, while continuing as a traditional shopping town, serving its wider hinterland including Glenullin, Ballerin and Aghadowey, the latter being the largest rural district in Ireland. Within a few yards of the centre of the town, the picturesque Agivey River, teeming with trout and salmon, meanders through the beautiful Garvagh Forest, which was the old Canning family estate. We hope you enjoy your visit to Garvagh. While you are here please feel free to drop into Garvagh Community Building and make use of our Tourist Information Access Point, or why not pick up a copy of our Heritage Trail, a must for all discerning visitors and residents.